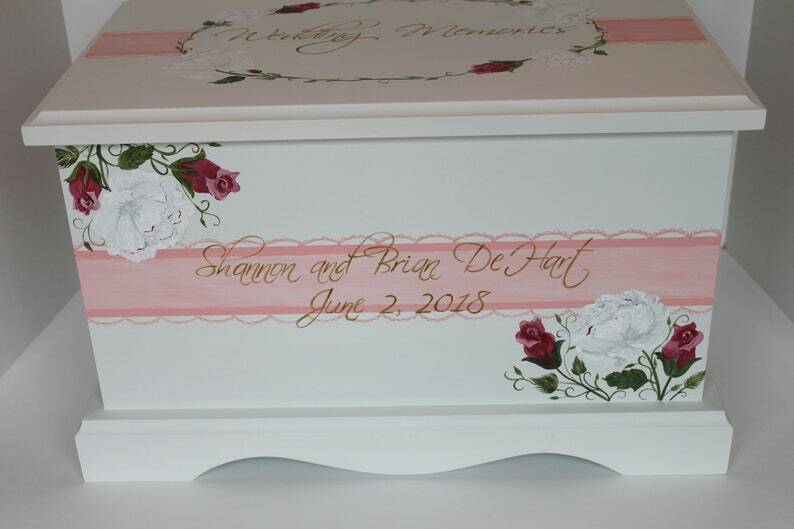 This poplar wood wedding keepsake chest measures 18" x 11.5" x 11.5" outside and 15" x 8.5" x 9" inside and is perfect for storing all of your precious wedding memorabilia. Each chest may be personalized with your names and wedding date. This design is hand painted with a custom blush lace, peony and rose design that matched the couple's wedding invitation. Custom colors are available. Chest has a fabric lined bottom and an acid free envelope on the inside lid for storing paper memorabilia or photos.